Ask your headteacher and governors to include the DofE into your school’s curriculum during quieter times in the academic year. 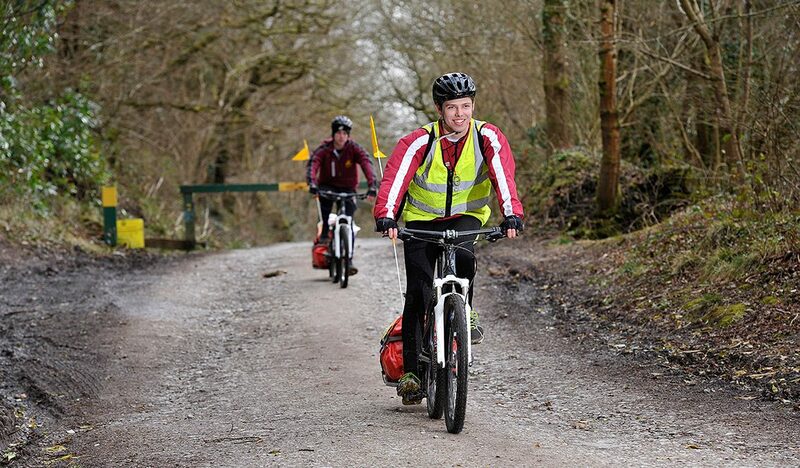 Having the DofE as part of the curriculum should enable more staff members to volunteer and therefore make it a much better experience for everyone involved. If potential new participants are unsure if they want to sign up to do their DofE, offer them a half-day taster session. This way, they can then test if it’s something they’d like to have a go at. Encourage your participants to share why they’re enjoying their DofE Volunteering section through your school’s Facebook and Twitter accounts. By creating your own hashtag for this, you’ll be able to celebrate their achievements with the wider community and other participants at your school can join in the conversation. Moving away from having one staff mentor per group to assembly-style presentations to share information can help you organise DofE expeditions at a more reasonable cost. Not only does this allow you to ensure that all of your students have the important details they need but also that you’ve covered the basics before they break into smaller groups to plan the specific details, such as their route. Invite parents to support another student to help with their costs, and reach out to local companies for sponsorships to help with funding DofE programmes at your school. Identify additional sources of funding available to support extracurricular activities, such as Pupil Premium, and submit your requests and bids (always demonstrating the impact and benefit of the DofE on your pupils, teachers and school as justification). Consider approaching governors to become volunteers too – they could support as Assessors, Verifiers or even as mentors for participants to ensure they keep on track of their programmes. Outline the resources you’ll require to support DofE delivery for the year (including staff numbers, time commitment and financial support). Include the key benefits of DofE participation for students and the school to justify your work and encourage support. You can use the report from last year’s outcomes to give tangible examples. A three-year development plan can help to show how any investment will support the growth of DofE activities for years to come and may include your predictions on future participation levels, as well as the staff level required to support this. This could include expanding your DofE offering to support pupils on an ‘alternative curriculum pathway’. You can hear more about one schools experience here. Produce a report on the previous year’s DofE successes (e.g. number of Awards achieved, number of young people progressing onto the next level, improved attainment and attendance statistics of participants and the destinations of school leavers who also achieved their Awards). Anecdotal quotes and feedback could also be included. This will help to demonstrate the positive impact of DofE activities on the whole school and encourage continued support for your work. Submit expedition dates to the central school calendar as soon as they are confirmed. Remember these could be scheduled Friday to Saturday instead of over a full weekend, or during an ‘activities/enrichment week’ at the end of the summer term. Using your DofE calendar, list the actions you will need to take for each activity (e.g. book campsites, distribute Welcome Packs, send out letters to parents) so that if you are ever off, these can be carried out by someone else in your absence. This will also help you work out where you might need more support. Create a calendar (online or printed) recording all of your important DofE activities. It could include dates for information evenings, meetings and drop-in sessions, training courses and expedition dates. Share it with volunteers and key staff so that they are informed and can avoid clashes with other activities. This will demonstrate to senior staff the time and resources required to support DofE delivery. General subject teachers could be recruited as a Supervisor or an Assessor, depending on their discipline or hobbies. Create a list of those who are happy to volunteer their time for this purpose and advertise it to your participants who are choosing their sectional activities. Set up a hub (online or in school) of DofE support resources, such as leaflets and activity sheets, that can be used by your volunteers. This could be located on your online shared folder system or even in a private Facebook group, which could also work well as a central place for discussions, arranging expedition dates and sharing best practice. Consider recruiting extra support outside of the school. Take a look at the Volunteer Management Toolkit for more support with recruitment or use the DofE’s Do-it.org account to advertise (email [email protected] to request a login). External funders or supporters (including school governors) might consider ‘donating their time’ to support your groups. Try approaching them with smaller roles/tasks to engage them initially. Remind teachers that DofE activities will help them build better relationships with their students and can also support CPD. It will help them gain new skills and training (e.g. first aid) and provide leadership opportunities. New teachers are a great group to engage – they will have less responsibilities and it can be a great way for them to integrate into school life. Invite potential volunteers along to a DofE meeting so that they can see what’s involved, and give them the opportunity to speak to some of your existing volunteers and participants. Put up a list of roles in the staff room so that teachers can put their names down. Break them up into easy, manageable tasks so that they can identify where their strengths would lie, e.g. an IT teacher could supervise an eDofE session and a PE teacher might consider becoming an accredited Assessor. Don’t forget to approach retired staff too. Carry out an audit of your existing volunteers, and then list all the roles/tasks you need to support your DofE delivery. Fill in names under the roles and identify any gaps that need filling; you can target volunteer recruitment to these gaps. It can be useful to create a specific expedition calendar which includes details of expedition training, practices and qualifying trips for each level of programme. Remember expeditions should take place from the end of March, through to the end of October. By including important school dates, such as exam periods and whole year trips, you can ensure there won’t be clashes for your pupils. Use your DofE calendar to map out how much support you will require for each activity. Ensure all involved add the dates to their diaries and consider recruiting more volunteers where needed. For expeditions, you could think about using an AAP. Create a DofE area on the school website, showcasing your DofE activities. This is also a great place to add information and links for parents and those interested in starting their DofE. Potential new pupils might look to see if a school offers DofE programmes when they are selecting their school or college. To help new parents understand the importance and significance of achieving a DofE Award, you might also like to invite recent Award holders along or representatives from universities or local businesses. Ask them to give a short speech, a quote in advance or be available to answer questions on the value of a DofE Award. Alternatively, you could share the DofE Skills page, which displays a great range of endorsements from businesses who believe in the DofE. Invite parents to an information event which covers all aspects of a DofE programme. Ensure you outline the programme requirements, give clear timescales, and set expectations of commitment levels and costs. Give clear examples of where they will need to support their son or daughter (e.g. finding appropriate activities and identifying their Assessors). If you have already decided on dates for expeditions and training, you can announce them here. It’s also worth introducing them to the key resources that will support their young person, including eDofE, the participant Welcome Pack, the LifeZone and the Reward Card. Why not consider recruiting them as volunteers? Before the event, identify some low commitment roles where they could come and support, and outline them at the meeting. Consider holding your Silver presentation event at the start of the year and use it as an opportunity to recruit the achievers to start their Gold programmes. They’ll be feeling a great sense of achievement and reflecting on their accomplishments. Invite their parents along and dedicate time at the end to get their support. Promoting DofE programmes to pupils at the start of the year is essential; engage whole year groups and ensure all have the opportunity to participate. Recruit through assemblies, flyers and posters and use current participants or recent Award holders to act as ambassadors. They could give talks, run Q&A sessions or create films or photo displays sharing their DofE experiences. You may find this video helpful for use in assemblies. Create a prominent DofE noticeboard within your school. You can use it to publicise DofE achievements to non-participants and teachers to raise awareness and encourage involvement. Building a positive image of the DofE in your school will ensure your activities are supported. You can also use the board to advertise DofE meetings, sign up sheets and give updates on progress.